All in all, there are 19 active aircraft carriers around the world. As you’ll see in this article, the vast majority of those belong to the United States. However, there are interesting technological developments being made in the world of aircraft carriers. Nations like England, China and Russia have exciting possibilities with carriers moving forward. The definition of an aircraft carrier is fairly loose. With the United States’ Nimitz-class of “super carriers”, all others tend to shy away in size and capability. Some carriers are labeled more as helicopter-carriers than aircraft carriers. However, the simplest definition of an aircraft carrier is: a warship with a flight deck on which aircraft can be launched and landed. So with that in mind, we bring you all 19 active aircraft carriers from oldest to newest. The Persian Gulf (Jun. 29, 2003) -- USS Nimitz (CVN 68) conducts flight operations in the Persian Gulf. Nimitz Carrier Strike Group and Carrier Air Wing Eleven (CVW-11) are deployed in support of Operation Iraqi Freedom, the multi-national coalition effort to liberate the Iraqi people, eliminate Iraq’s weapons of mass destruction, and end the regime of Saddam Hussein. The USS Nimitz is the oldest of the active aircraft carriers in the world. It is the namesake of its class of aircraft carriers. The Nimitz-class “supercarriers” take their name from famous U.S. Navy Admiral Chester W. Nimitz. The USS Nimitz is 1,092 feet long, 252 feet wide and 4.5 acres is the area of its flight deck. It’s powered by two nuclear power plants and reaches speeds upwards of 30 knots. The USS Nimitz processes 1 million pounds of mail per year. Its two barbershops trim more that 1,500 heads per week. The USS Nimitz left Norfolk, Va. on July 7, 1976 – embarking for the Mediterranean on its first deployment. Shortly after, it was sent to the Indian Ocean as tensions heightened prior to the Iran Hostage Crisis. During the crisis, a rescue attempt involving helicopters launched from Nimitz, but was aborted while the helicopters flew over the Iranian Desert. Nimitz-class aircraft carrier USS Dwight D. Eisenhower (CVN 69) transits the Mediterranean Sea. Eisenhower and embarked Carrier Air Wing (CVW) 7 are on a regularly scheduled deployment in support of Maritime Security Operations (MSO). Named after the 34th President of the United States, USS Dwight D. Eisenhower is the second in line of Nimitz-class carriers. Ike made her first Mediterranean Sea deployment in 1978 after 14 months of fleet training. It’s deployed to the Mediterranean Sea eight times in its lifespan. It’s powered by two nuclear reactors and has four main engines. It has four aircraft elevators, four arresting gear cables and four catapults. 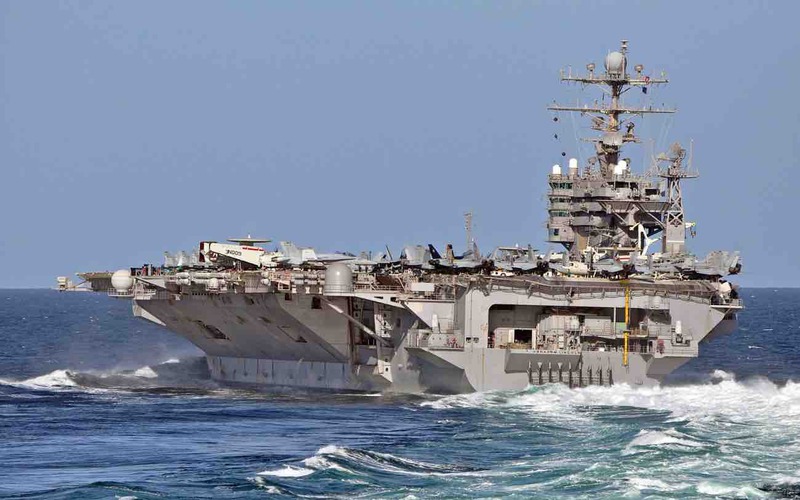 USS Dwight D. Eisenhower is the first carrier to conduct sustained operations in the Red Sea. 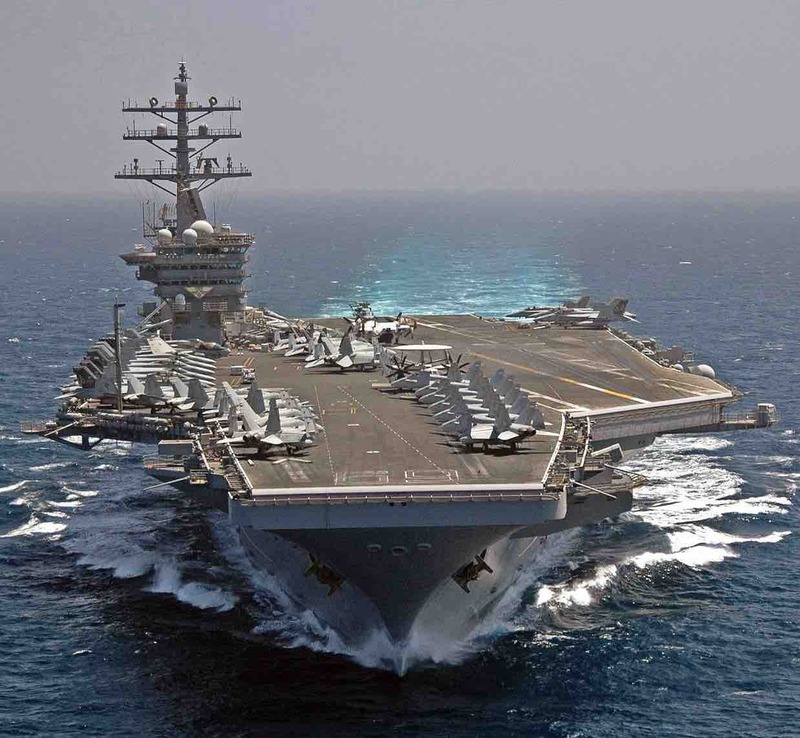 To get from the Mediterranean Sea to the Red Sea, USS Dwight D. Eisenhower became the second nuclear-powered aircraft carrier to pass through the gangly Suez Canal. Once there, Ike served as a ready strike force to lend aid if Iraq invaded Saudi Arabia. Also, during its aid to a United National embargo on Iraq, USS Dwight D. Eisenhower ran maritime interception operations. She is second-oldest of all active aircraft carriers. 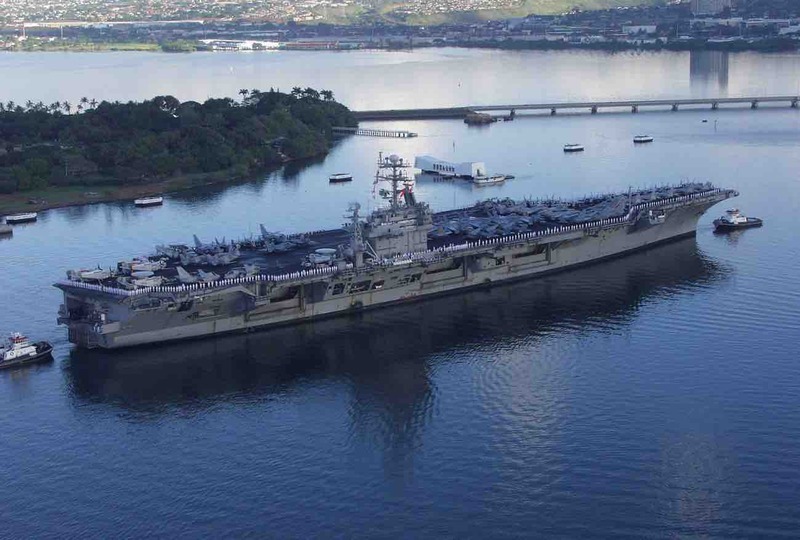 USS Carl Vinson (CVN 70) renders honors as she passes by the Arizona Memorial in Pearl Harbor, Hawaii. The Carl Vinson and her battle group are stopping in Hawaii for a port visit before returning home after completing a regularly scheduled deployment in support of Operation Enduring Freedom. USS Carl Vinson was named after Congressman Carl Vinson from Georgia. In fact, Congressman Vinson became the first person in United States history to witness the launching of a military ship named in his honor. USS Carl Vinson, like the rest of the Nimitz-class aircraft carriers, was built by Newport News Shipbuilding Co. in Newport News, Va. This super carrier displaces almost 100,000 tons with a full load and carries anywhere from 60-90 aircraft at a time. The aircraft carrier deployed in the Indian Ocean for 107 consecutive days at sea operations in the beginning of 1984. Because of its operations conducted from November 1984 to May 1985, the carrier received its first Meritorious Unit Commendations. Additionally, it won the 1984 Admiral Flatley Memorial Award for operational readiness and aviation safety. The USS Carl Vinson was the first of all active aircraft carriers to operate in the Bering Sea. 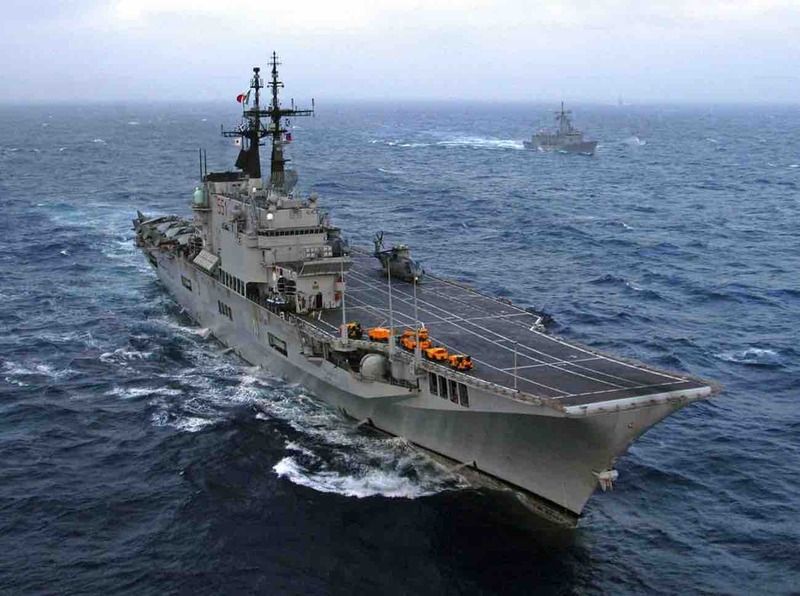 The Italian aircraft carrier ITS Giuseppe Garibaldi (C 551) and the Turkish frigate TCG Gediz (F 495) steam through the Atlantic Ocean while participating in Majestic Eagle 2004. Majestic Eagle is a multinational exercise being conducted off the coast of Morocco. The exercise demonstrates the combined force capabilities and quick response times of the participating naval, air, undersea and surface warfare groups. The first ever Italian aircraft carrier was built and commissioned during a time when Italian Naval law states that combat aircraft could not be operated from a ship. However, in 1992 that law changed and the Giuseppe Garibaldi went to work. The original design only intended for VSTOL aircraft to operate from the Garibaldi. But with the addition of a ski-jump ramp at the end of the runway, short takeoff aircraft were added to the inventory. The Giuseppe Garibaldi is powered by 4 General Electric-Fiat LM2500 gas turbines and can reach up to 30 knots. It has a range of 7000 miles knots and carries 400 troops. She is equipped as a fleet flagship and serves as an ‘interpreter’ between the deployed ships and the on-shore Italian air defence system. The Giuseppe Garibaldi is one of a handful of active aircraft carriers that hasn’t participated in any major Naval battles or events. The aircraft carrier USS Theodore Roosevelt (CVN 71) transits the Arabian Gulf. Theodore Roosevelt and its carrier strike group are deployed to the U.S. 5th Fleet area of operations in support of maritime security operations to reassure allies and partners and preserve the freedom of navigation and the free flow of commerce in the region. 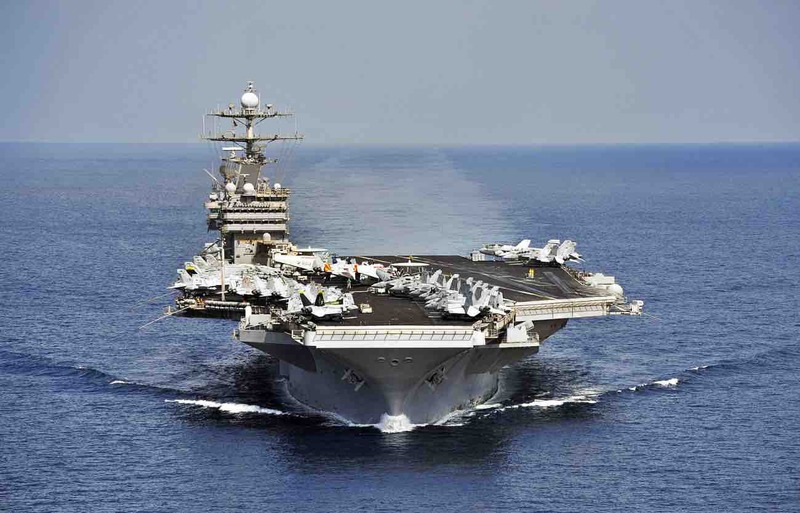 The USS Theodore Roosevelt is the fourth of ten Nimitz-class active aircraft carriers. 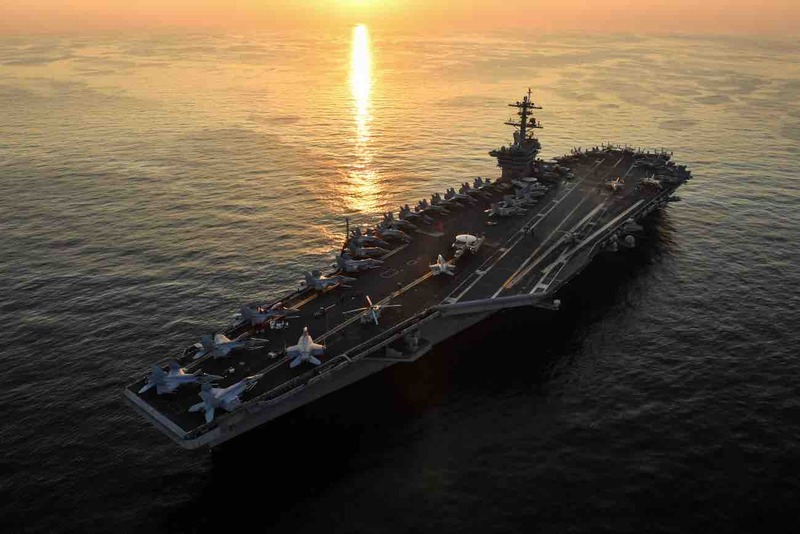 USS Theodore Roosevelt participated in The Gulf War (1991), Operation Allied Force (1999), Operation Enduring Freedom (2001-02) and Operation Iraqi Freedom (2003). It’s beam measures 134 feet and its draft, 38.4 feet. She comes loaded with three Mk 29 NATO Sea Sparrow launchers, and three 20mm Phalanx CIWS Mk 15 for defense. The USS Theodore Roosevelt has a specific TV station and there are over 3,000 TV’s on board to allow the sailors to watch the program. The aircraft carrier hold up to 3.3 million gallons of aviation fuel. She received the Golden Anchor Award for best retention in an Atlantic Fleet Carrier as well as the Battenberg Cup for the best ship in the Atlantic Fleet. The aircraft carrier USS Abraham Lincoln (CVN 72) maneuvers through a turn while underway in the U.S. 5th Fleet area of responsibility conducting maritime security operations and theater security cooperation efforts. Named after the sixteenth president of the United States, the USS Abraham Lincoln is the fifth Nimitz-class aircraft carrier. These active aircraft carriers are estimated to have a 50-years service life. Each of the two rudders on this, and every, Nimitz-class carrier weigh 45.5 tons each and are 29×22 feet. Over 5,500 pounds of laundry is washed each day on the ship, 500 pounds of hamburger meat is consumed and over 800 pounds of vegetables are consumed each day on the USS Abraham Lincoln. In 1990, it set out on its first official action – transferring from the Atlantic Fleet to the Pacific Fleet. Along the long trip around South America, the USS Abraham Lincoln stopped to conduct several multilateral training exercises in Brazil, Argentina, Uruguay, and Chile among others. It’s first deployment was to the Western Pacific in response to Operation Desert Shield/Desert Storm. During a 2004 port visit to Hong Kong, the USS Abraham Lincoln was redirected to Thailand and Indonesia following the massive tsunami that wiped out so many villages and islands in the area. Her embarked helicopters of HS-2 and HSL-47 distributed food, medicine and other urgently needed goods. is an aircraft carrier (heavy aircraft-carrying missile cruiser, or TAVKR, in Russian classification) serving as the flagship of the Russian Navy. She was built by the Black Sea Shipyard, the sole manufacturer of Soviet aircraft carriers, in Nikolayev within the Ukrainian Soviet Socialist Republic (SSR). 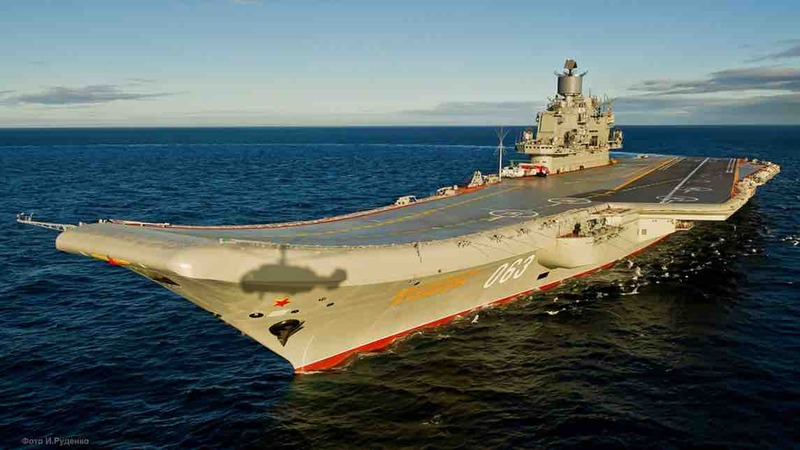 Admiral Flota Sovetskogo Soyuza Kuznetsov is the official, Russian moniker for the flagship of their Navy. The Admiral Kuznetsov aircraft carrier laid down in 1983 but commissioned eight years later. This foreshadowed Admiral Kuznetsov’s life span, unfortunately for the Russians. The 930 feet long, 235 feet wide, and 210 feet high Kuznetzov-class carrier is sidelined for much of its life. A chronic bad propulsion system continues to relegate the ship to port. When deployed, she oftentimes is escorted by a tugboat in the event of a breakdown at sea. Admiral Kuznetsov first deployed in March of 1996 on a 90-day Mediterranean mission. After that, her next deployment wasn’t until the winter of 2007. In the late 2000s and early 2010s, Admiral Kuznetsov maintained a fairly healthy schedule of Mediterranean deployments and training exercises. Nikolay Kuznetsov was a former Admiral of the Fleet of the Soviet Union. Also, he served as People’s Commissar of the Navy during World War II. Now, his name is stamped on one of 19 active aircraft carriers. The U.S. Navy aircraft carrier USS George Washington (CVN-73) transits the Pacific Ocean. George Washington and its embarked air wing, Carrier Air Wing 5 (CVW-5), were en route to conduct a hull-swap with the USS Ronald Reagan (CVN-76) after serving seven years as the U.S. Navy's only forward-deployed aircraft carrier in Yokosuka, Japan. USS George Washington is the fourth ship in the U.S. Navy named after the first president. She is the sixth of 10 active aircraft carriers in the Nimitz-class. Its maiden voyage in May 1994 went to the Mediterranean Sea and Arabian Gulf. The aircraft carrier provided air defense to New York City in September, 2001 following the 9/11 attacks. In 2008, USS George Washington relieved USS Kitty Hawk in Yokosuka, Japan and became the first nuclear-powered ship to be forward deployed. In 2017, it returned to Norfolk, Va. for a four-year Refueling and Complex Overhaul. The USS George Washington will deploy again to Japan once this process is complete. Like most Nimitz-class carriers, the USS George Washington is like a small village. The medical unit onboard sees over well over 10,000 patients in a year including: over 250 flight physicals, over 1,500 physical exams, over 100 surgeries and gives over 11,000 immunizations. The dentist onboard, in an average month, sees 500 patients requiring 200 exams, 150 cleanings, 53 tooth extractions, 10 crowns, and 75 fillings. Aircraft from Carrier Air Wing 9 fly over the aircraft carrier USS John C. Stennis (CVN 74) in a delta formation as the ship steams for its home port of San Diego, Calif., on June 29, 2000. 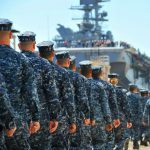 The Stennis is hosting nearly one thousand friends and family members, called Tigers, for the transit from Pearl Harbor, Hawaii, to San Diego. This Tiger Cruise allows the friends and family members to experience life at sea with their sailors. John C. Stennis was a U.S. Senator from Mississippi for over 40 years. President Ronald Reagan announced at a dinner honoring Stennis that the next U.S. aircraft carrier will be named the USS John C. Stennis. The first carrier landing of an F/A-18 E/F in naval history took place in January 1997 on the USS John C Stennis. Six months later a helicopter crew rescued three Canadian Sailors off the coast of Nantucket, Massachusetts after a heavy storm capsized their boats. The mattresses from the entire carrier would stretch more than nine miles if lined up end to end. There are 2,000 telephones, 28,000 sheets, 14,000 pillowcases and 60,000 tons of structural steel onboard. USS John C. Stinson got its anchors from the decommissioned USS Forrestal. The weight of one anchor is 30 tons. Even for active aircraft carriers, that’s still on the heavy side. The Royal Thai Naval vessel HTMS CHAKRINARUEBET (CVH 911) in the South China Sea. 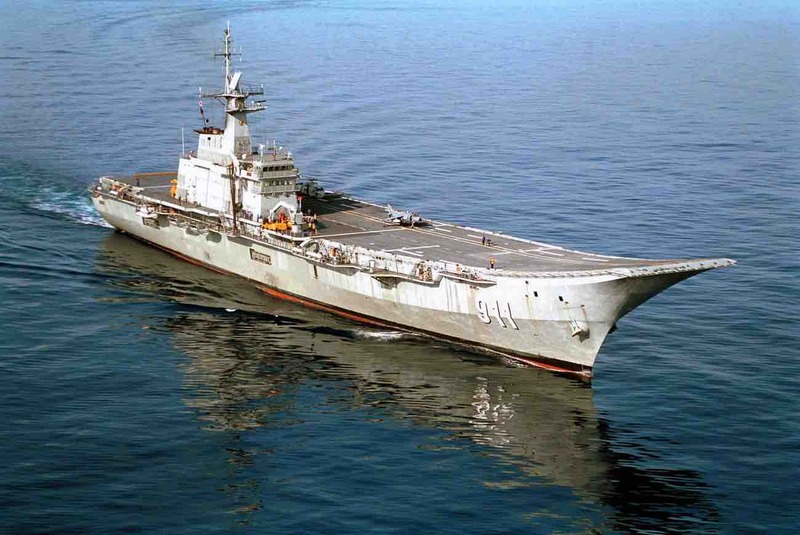 The Chakri Naruebet (The Great of the Chakri Dynasty or In Honor of the Chakri Dynasty) is the first of any active aircraft carriers operated by a country in Southeast Asia. The aircraft carrier is 599 feet long with a crew of 455 men. Chakri Naruebet is powered by 2 x 44 240 hp gas turbines and 2 x 11 780 hp Diesel engines – giving the carrier a max speed of 26 knots (30mph). She accommodates six to nine AV-8S Matador attack aircraft, and as many as twenty Sikorsky S-70B Seahawk/S-76 Sea King or Chinook helicopters. 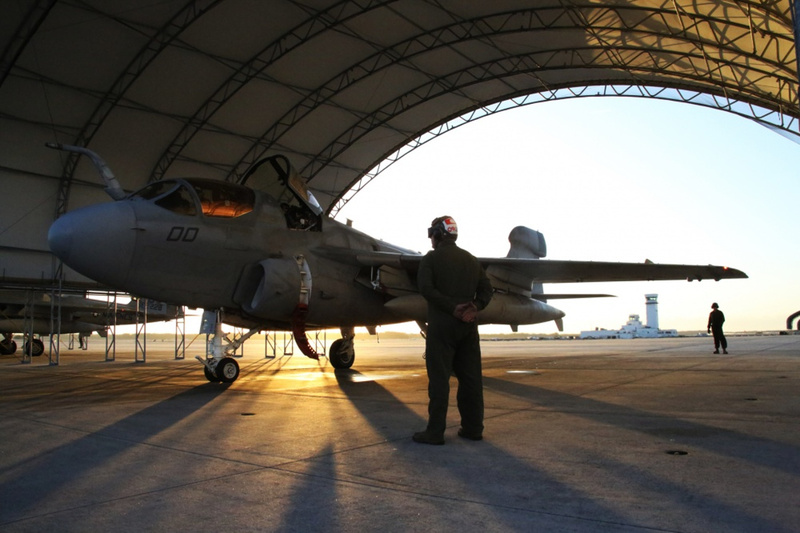 Chakri Naruebet has a 12° ski jump to enable the use of the AV-8S Matador aircraft. Surveillance, protection, and search and rescue are the carrier’s main roles, but it is also used for flagship command and control, and air support for the Thai surface fleet or disaster relief. The Chakri Naruebet is the smallest active aircraft carrier in the world. 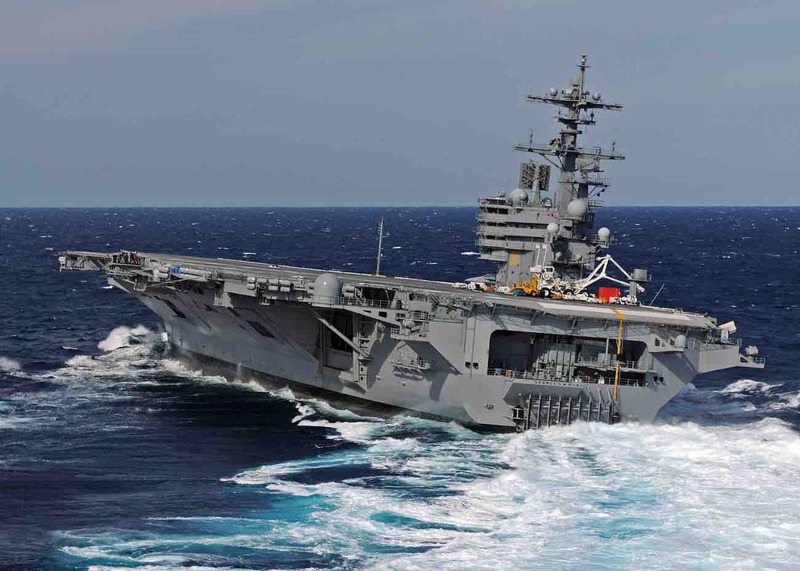 The aircraft carrier USS Harry S. Truman (CVN 75) operates in the Arabian Sea in support of Operation Enduring Freedom. 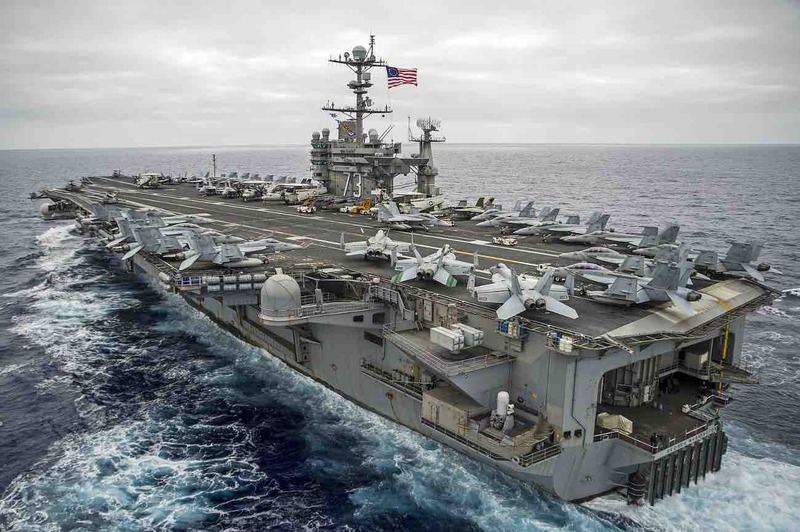 The Harry S. Truman Carrier Strike Group is deployed supporting maritime security operations and theater security cooperation efforts in the U.S. 5th Fleet area of responsibility. The first ship in the U.S. Navy to bear the name, the USS Harry S. Truman first came alive when construction began in 1989. Nine years later, she went on her maiden deployment to the Mediterranean Sea. During Operation Southern Watch in February 2001, aircraft from the carrier attacked anti-air warfare sites in Iraq. 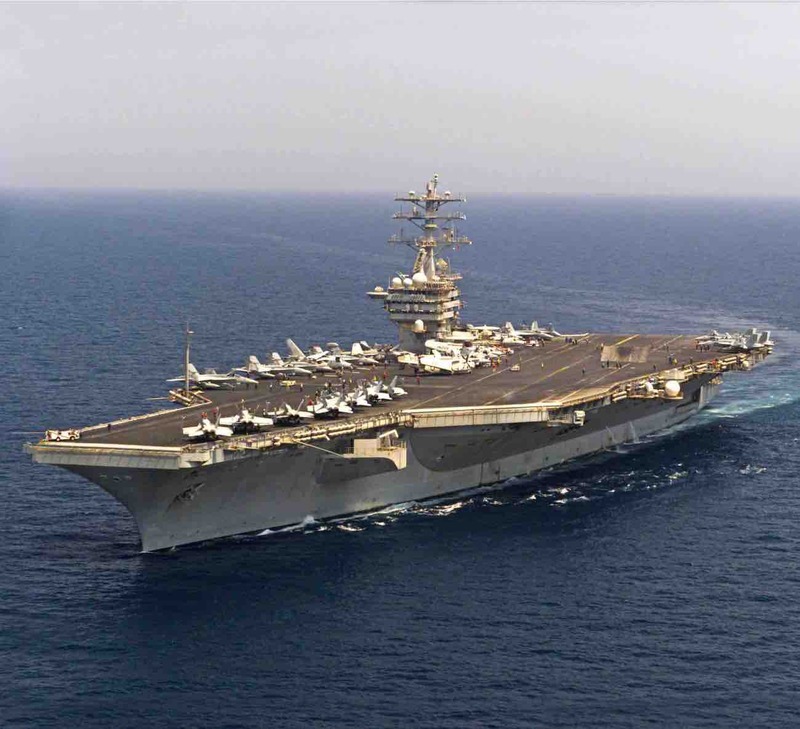 The USS Harry S. Truman also participated in Operations Enduring Freedom and Iraqi Freedom in 2003. She has deployed to the Mediterranean Sea and Arabian Gulf five times in her lifetime. There are over 140,000 rolls of toilet paper on board the USS Harry S. Truman – as well as any of the other Nimitz-class active aircraft carriers. There are 600,000 ball-point pens and 1.5 million sheets of paper on board. The aircraft carrier is made of 190 modules, with the overall weight of the modules reaching 900 tons. Also, 1,000,000 pounds of aluminum are in the ship. A C-2A Greyhound assigned to the aircraft carrier USS Harry S. Truman (CVN 75) launches from the French navy aircraft carrier Charles de Gaulle (R 91). 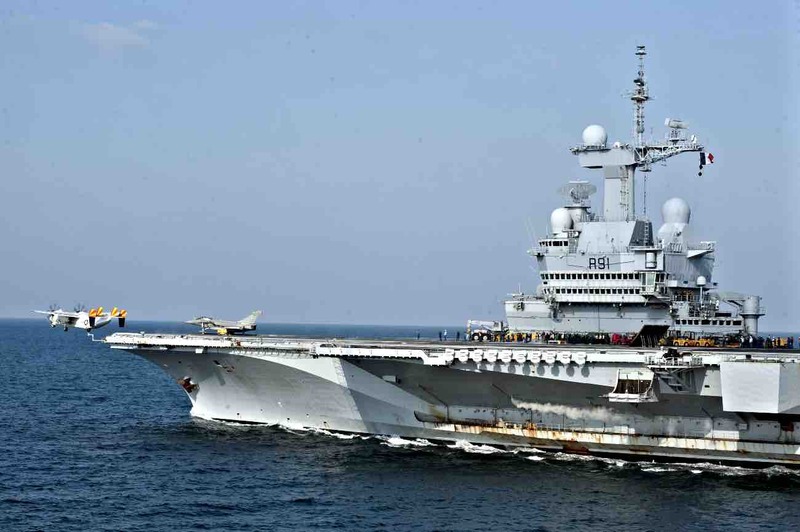 Charles de Gaulle, flagship for Task Force 473, is conducting operations with the Harry S. Truman Carrier Strike Group to enhance levels of cooperation and interoperability, enhance mutual maritime capabilities and promote long-term regional stability in the U.S. 5th Fleet area of responsibility. The first nuclear-powered surface craft ever made by the French is also their Navy’s flagship; the Charles de Gaulle aircraft carrier. Of all active aircraft carriers, it is the only non-American carrier to be nuclear-powered. French General and Free French Forces statesman Charles de Gaulle is the namesake of this aircraft carrier, referred to by crews as “CDG”. 1,950 crew members are aboard this 857-foot long carrier that weighs 42,000 tons. She accommodates up to 40 aircraft – any combination of: Dassault Super Etendard fighters, Dassault Mirage 2000 strike fighters, Northrop Grumman E-2C Hawkeye AEW aircraft, Eurocopter AS 565MB Panther, and 2 Eurocopter Dauphin Helicopters. The Charles de Gaulle supported Allied forces during Operation Enduring Freedom. The aircraft carrier, alongside other French Navy ships and submarine, launched reconnaissance sorties and daily raids against Taliban forces in Afghanistan. Charles de Gaulle committed to supporting airborne French efforts against ISIS in Iraq in February 2015. The aircraft carrier is expected to be in service until 2040. Sailors aboard USS Ronald Reagan (CVN 76) “Man the Rails” as the Navy’s newest Nimitz class aircraft carrier arrives in For Lauderdale, Fla. U.S. The 9th aircraft carrier in the United States’ fleet of Nimitz-class active aircraft carriers is the USS Ronald Reagan. The island house atop the carriers weighs 650 tons, and the one on USS Ronald Reagan was put in place on November 11, 2000. Four months later, Mrs. Nancy Reagan christened the ship. 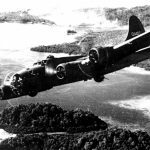 It’s first action was to circumnavigate South America, switching bases from Norfolk, Va. to San Diego, Cal. in 2004. 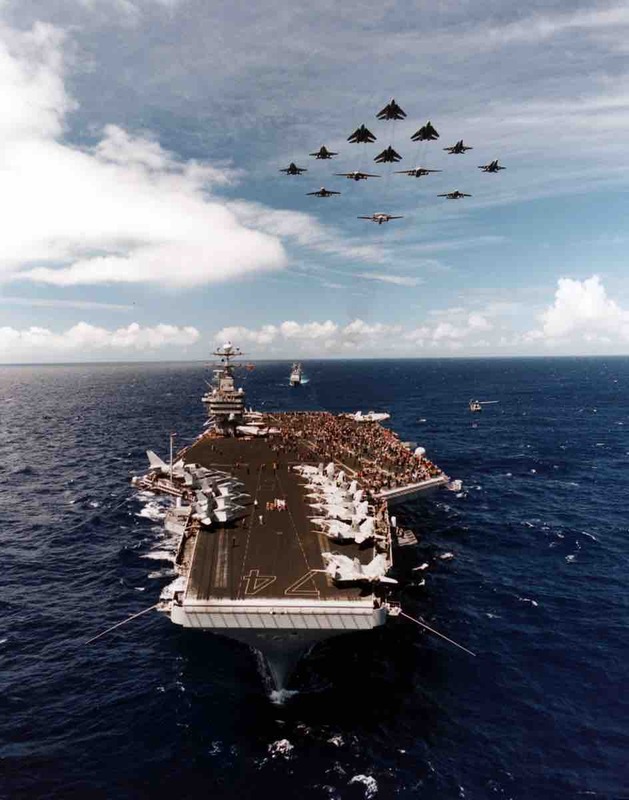 January 2006, USS Ronald Reagan embarked on its maiden deployment, to the Pacific Ocean and Persian Gulf in support of Operations Enduring and Iraqi Freedom. USS Ronald Reagan left San Diego in August 2015 as the Forward Deployed Naval Force (FDNF) replacement for USS George Washington in Yokosuka, Japan. 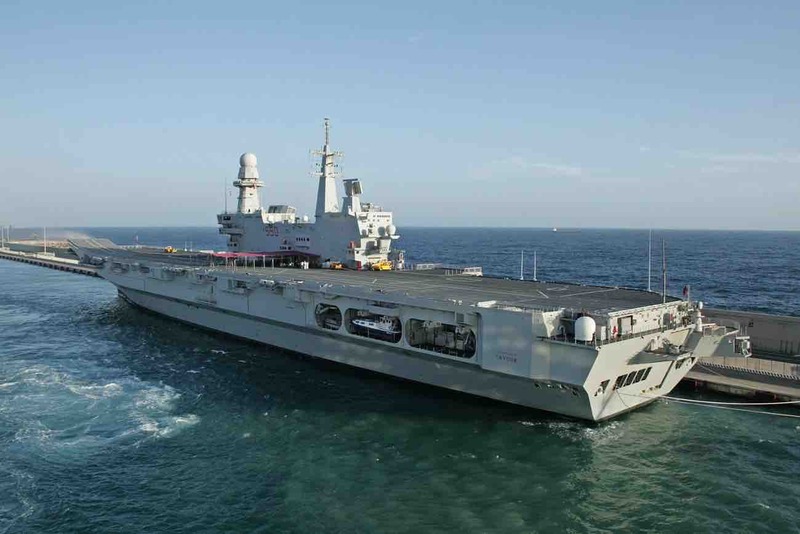 The flagship to the Italian Navy, the Cavour is an 800-foot long aircraft carrier that holds 1,202 troops and reaches a top cruising speed of 27 knots. She accommodates eight VTOL aircraft, usually the AV-8B Harrier or F-35B Lightning II, and 12 helicopters. Six diesel engines alongside four General Electric/Avio LM2500+ series gas turbines put out 88,000 horsepower. Additionally, it has a range of 7,000 miles. The contract to build Cavour was signed in 2000. In March of 2008, the aircraft carrier was commissioned, and she saw her first deployment in 2009. Cavour aided Haiti in 2010 in the aftermath of the earthquake. Like most active aircraft carriers, she gets her name from a famous statesman. Cavour gets its names from Camillo Benso, Count of Cavour – a statesman popular for efforts toward unifying Italy in the mid-1860s. The aircraft carrier USS George H.W. Bush (CVN 77), the Navy's 10th and final Nimitz-class aircraft carrier, heels hard to starboard during high-speed turn drills. George H.W. Bush is underway in the Atlantic Ocean supporting fleet training operations. The 10th and final installment in the Nimitz class of active aircraft carriers, the USS George H.W. Bush is named after the 41st President of the United States, George Herbert Walker Bush. The aircraft carrier houses over 6,000 crew and aircrew members – like all Nimitz class carriers. However, unlike the rest of the ships in its class, the USS George H.W. Bush is integrated with the newest technology available during construction. 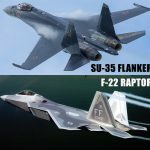 The upgrades include a new radar tower, navigation and communication systems upgrades, upgraded aircraft launch and recovery equipment as well as a new fuel system for improved control of aircraft fuel. 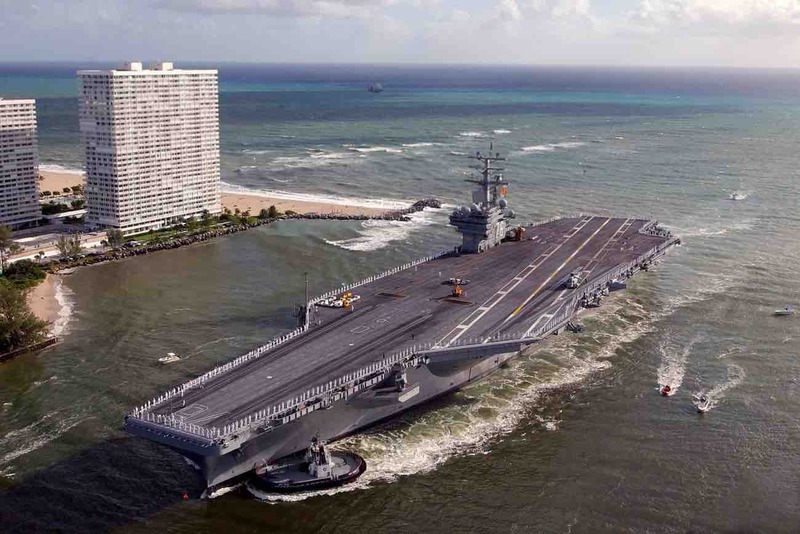 The carrier is nuclear-powered, so it shouldn’t need refueling for its first 20 years. 6-centimeter thick Kevlar panels protect sections of the hull of the USS George H.W. Bush. She accommodates upwards of 50 aircraft. The Hornet in multiple variants (F/A-18A,C,E and F) the Grumman EA-6B Prowler, the Grumman E-2C Hawkeye, as well as 15 helicopters (Sikorsky SH-60F, HH-60H Seahawk and SH-60B Seahawks) are the usual mixture of aircraft on board. Aircraft Carrier Liaoning CV-16 at Hong Kong Waters, July 2017. The Soviet Union built a “heavy aircraft-carriying cruiser”, or at lest started to, before selling the unfinished product to China in 1998. Named Varyag originally, this carrier was the second aircraft carrier in the Kuznetsov-class of carriers. Liaoning underwent major upgrades and extensions over the next decade in order to modernize the ship for China’s fleet. Finally, the People’s Liberation Army Navy commissioned the vessel in 2012; it is currently declared combat-ready. 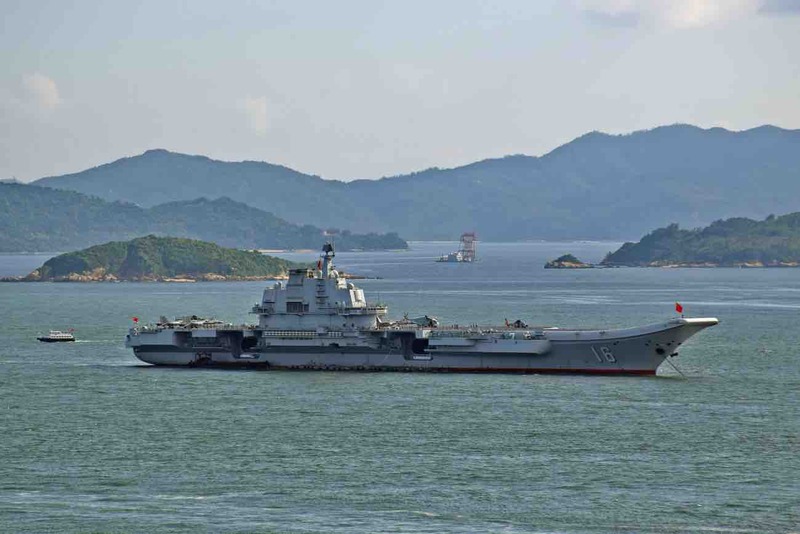 Liaoning is 1000 feet long and holds 2000 crew members as well as 500 in the air wing. Eight boilers power four 37.3 MW steam turbines giving the Liaoning a max cruise speed of 28 knots. She accommodates up to 50 fixed-wing aircraft and helicopters, mostly Chinese J-15 carrier-based fighters. Additionally, Liaoning holds a mixture of Chinese Z-8 helicopters, Russian Ka-27 helicopters, and Ka-31 helicopters. For all active aircraft carriers, 50+ aircraft is on the high end. A cropped close shot of the Indian aircraft carrier INS Vikramaditya. Another Russian decommissioned ship, the INS Vikramaditya was once upon a time named the Admiral Gorshkov. Originally, it’s duty was vertical take-off and landing (VTOL) missile cruiser carrier. However, in 2013, India commissioned its largest short take-off, but assisted recovery (STOBAR) aircraft carrier. 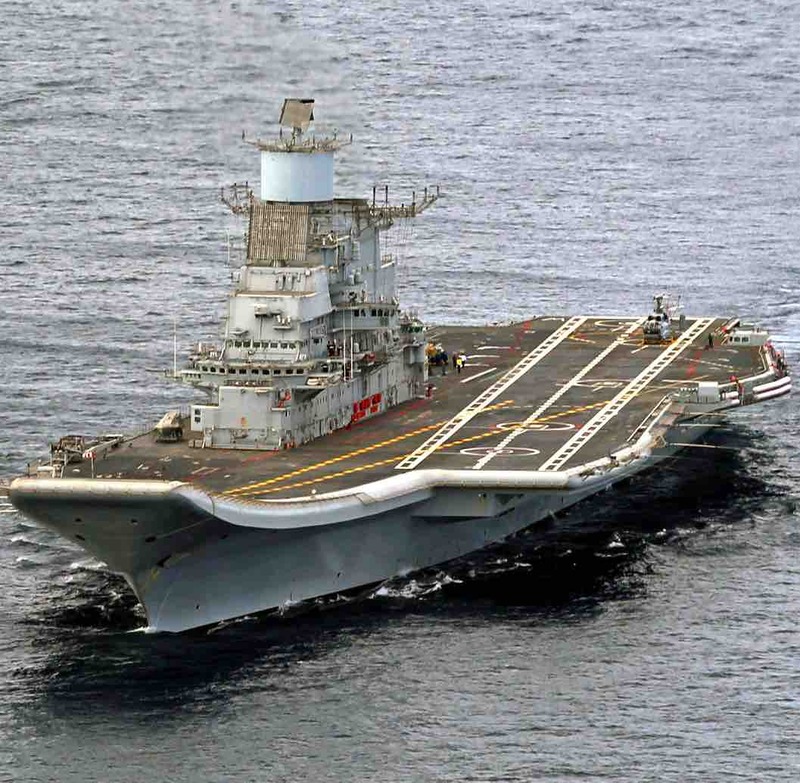 INS Vikramaditya accommodates roughly 30 aircraft, usually a mixture of MiG 29Ks, Sea Harrier combat aircraft, Ka-31 helicopters, Ka-28 helicopters, and Sikorsky Sea King helicopters. The carrier completed final sea trials in 2013 and most recently spent 2015-2017 sidelined in order to receive armament upgrades. INS Vikramaditya is among the active aircraft carriers that are combat ready. She is 931 feet long, holds over 1,600 crew and personnel, is equipped with flight deck lighting systems, new AC and refrigeration plants, 14° ski ramp, and two reverse osmosis plants that produce fresh water every day. The U.S. Navy aircraft carrier USS Gerald R. Ford (CVN-78) underway on its own power for the first time. The first-of-class ship -- the first new U.S. aircraft carrier design in 40 years -- spent several days conducting builder's sea trials, a comprehensive test of many of the ship's key systems and technologies. USS Gerald R. Ford is the first carrier in the new Ford-class line of U.S. Navy aircraft carriers. In terms of specifications, the Ford-class carriers are very similar to the Nimitz-class. The ship’s length, beam, flight deck size, speed, engines and aircraft capacity are all roughly the same as its predecessor’s. However, the technology behind these measurements is heightened – greatly. The USS Gerald R. Ford is one of, if not the most, technologically advanced active aircraft carriers in the world. Electric-drive components replace legacy steam-powered systems. 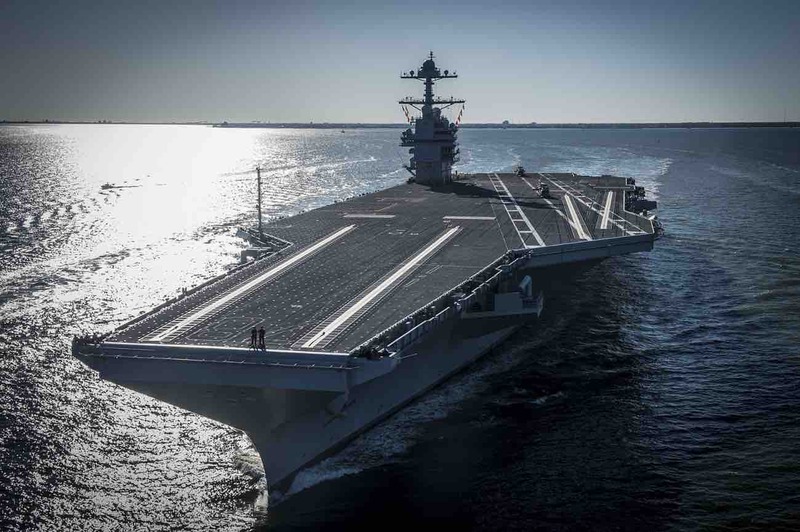 This upgrade gives USS Gerald R. Ford three times more electrical-generation capacity than Nimitz-class carriers, making it available to future technological innovations. Additionally, USS Gerald R. Ford is the Navy’s first aircraft carrier to be completely designed using a 3-dimensional product model. Both the launch and arresting gear systems are overhauled and improved. 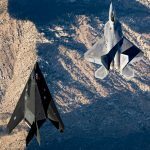 The anticipated state-of-the-art Electromagnetic Aircraft Launch System will reduce maintenance time in the long haul as well as make day-to-day operations cheaper and easier. The island house is smaller and further aft on the ship. This increases space for flight-deck operations and aircraft maintenance. Additionally, the smaller house enables the air wing to launch more aircraft sorties. Also, quality of life improved throughout the ship with better gyms, improved berthing compartments, and more ergonomic workspaces. The Royal Navy's new aircraft carrier HMS Queen Elizabeth arrives in Gibraltar for her first overseas port visit. The 65,000 tonne future flagship was conducting a routine logistics stop having left her home in Portsmouth a week earlier for helicopter trials. The only other ship in the Royal Navy’s history named Queen Elizabeth was commissioned in 1915. She fought in the Dardanelles and supported the Galipoli campaign. However, this brand new aircraft carrier has yet to see battle. The HMS Queen Elizabeth is the first in the newly-announced Queen Elizabeth-class of active aircraft carriers. Next in line is the HMS Prince of Wales. 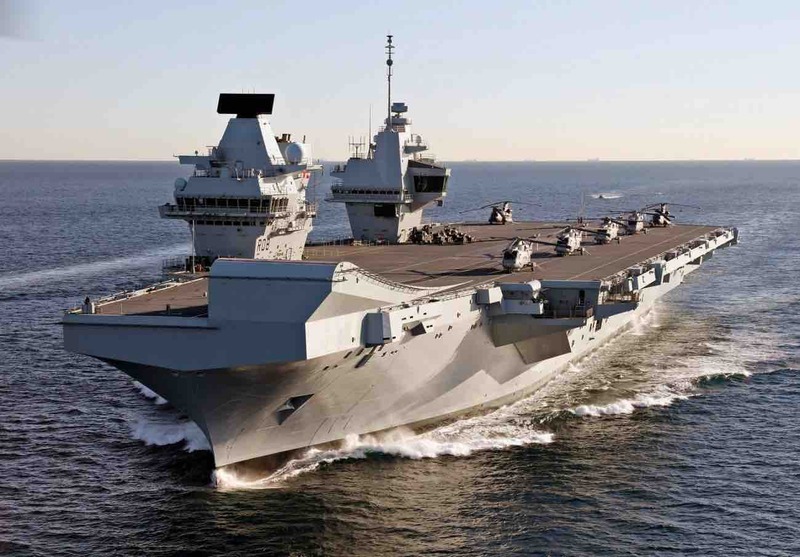 The Queen Elizabeth measures 920 feet long with a 240 foot beam, displaces 72,000 tons, and a combination of two Rolls-Royce Marine Trent gas turbine engines and four Warsila 38 marine diesel engines power the carrier. Just like the new U.S. Ford-class of aircraft carriers, the Queen Elizabeth is designed with life in mind. Ergonomic living quarters and work spaces are a priority. The team of Babcock, Thales, BAE Systems and the Ministry of Defence all worked together to create this line of aircraft carriers.